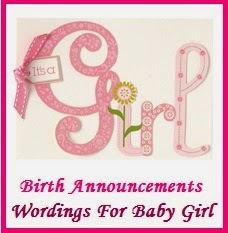 Sample Messages Box offers you free sample messages and wishes for all occasions. Your one stop destination for example messages,sample text messages, sample email messages and sample wishes.You will find thoughtful sample wordings written from the heart, for everyday occasions, for everyone! 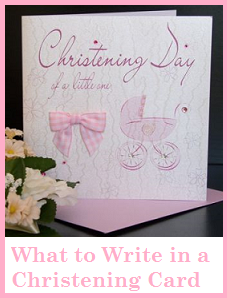 Are you looking for little help and inspiration to what to write in a Christening card or Baptism card? Well you have reached the right spot? Read on to find the perfect Christening/Baptism message right here. Christening or Baptism is an important religious occasion. 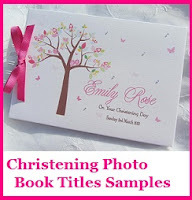 It is also the beginning of a new life with Christ and it is indeed a very meaningful and joyous occasion, Here is an amazing collection of sample Christening messages which you can send to your loved ones on their Christening or Baptism. To my Goddaughter Ashlie - May this perfect gift of God add joy to your heart. As the Holy water is sprinkled on you, may you be covered with his perfect love. May you also grow in the Christian faith. Blessings! - You loving Godmother Molly. 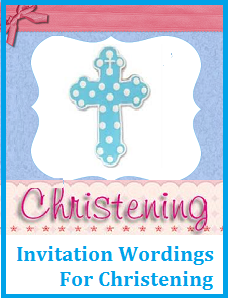 Christening wishes for your beautiful daughter! Today as the Holy water is sprinkled on her may she be filled with God’s perfect love. Congratulations! Blessings on your daughter’s Baptism! We are all excited to be part of your sweet baby Vanitas’s baptism. May today mark a new beginning in her spiritual growth. May this day also add lots of sweet memories. Congratulations on this special day as your baby is baptised and christened. Wishing your family a memorable day. All the best! Thank you for inviting us for the Baptism and Christening function of your little one. May your little one be showered with love from above. Blessings! Congrats little Angela on your special day. May you grow each day in long lasting Christian faith. Blessings! 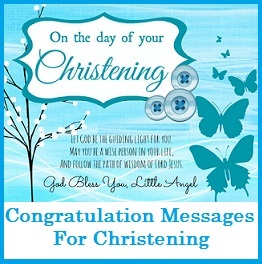 May your little one be blessed from above on this Christening day and may you all have sweet memories of this day. To My Special Godson – I am so honoured to be your Godfather. I make promises this day to help, support and guide you grow in the Christian faith. I will always pray for you and wish that this Christening day will mark the beginning of a life time marked with joy, happiness and blessings from above. With much love on your special day, Godfather Bryan. Dear Louise and Mark! Thank you so much for inviting us to the christening of your beautiful daughter. Many congratulations on the christening of your baby. Hope you all have a great day leaving behind many fond memories. - With lots of love Mrs and Mr John. Congratulations on your baby’s Baptism! 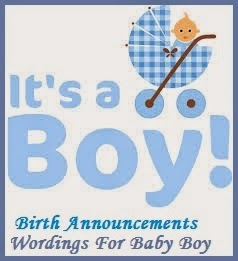 On this Baptism day, I wish that your baby boy will grow in loving kindness and everlasting care of Almighty God. May the Lord be with him and with your family. Blessings! 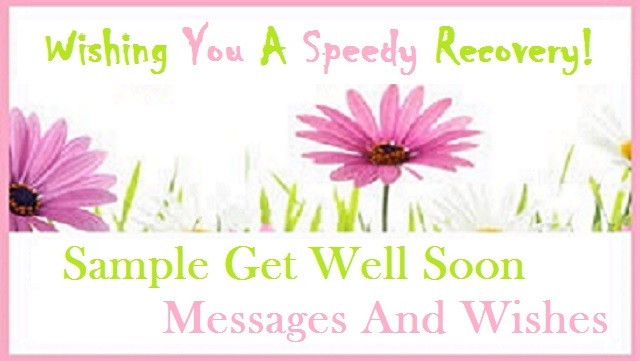 Get Well Soon Messages & Wishes! Gift Ideas For Loved Ones!